The Donald Trump administration may have narrowed the path for foreigners to enter the US, but nearly all American employers believe overseas talent is integral to their business. Up to 95% of US employers maintain that foreign nationals are important to their company’s talent acquisition strategy, a new report by global immigration firm Envoy says. “…immigrant talent now accounts for one in every 3.5 inventions in America, a dramatic growth from the 1970s, when foreigners contributed one in 12 patents,” William Kerr, a professor of business administration at Harvard Business School, said in the report, citing research from his book The Gift of Global Talent: How Migration Shapes Business, Economy & Society. For the fourth edition of its Immigration Trends Report, Envoy collated responses from 405 human resources professionals and hiring managers between Nov. 27, 2018 and Dec. 17, 2018. In 2019, eight in 10 employers expect their foreign national headcount to either increase or stay the same, compared with last year, the survey found. Foreign talent is especially critical for plugging the skills gaps in science, technology, engineering, and math (STEM) fields. While less than 1% of all US jobs go to foreign workers, they account for over 12% of tech employees. 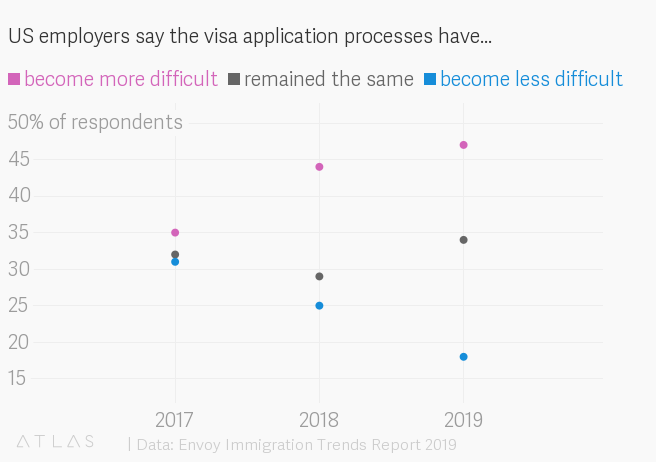 This year, a higher share of respondents (47%) said their company’s visa application process has become more difficult compared with earlier years. 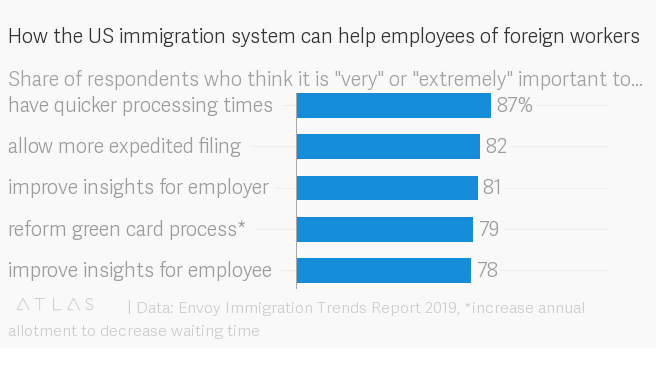 When asked specifically whether RFEs—notices US authorities issue to visa applicants seeking more information on their applications—had gone up for their employees in the past five years, over half said yes. This is in line with public data which show that the share of RFEs issued for H-1B cases jumped to 60% in October-December 2018, marking a significant uptick from 28% in the same period two years prior. Most companies were strong-armed in finding ways to cope with the current administration’s hostility towards immigrant workers, reallocating time and budget across people and projects. Only 12% of respondents said the current US immigration system did not impact their organisation’s hiring and retention strategies. In a bid to retain foreign nationals in their firms—and in the country—68% of the companies have sponsored green cards for their workers. Two-thirds of the respondents do so within the employee’s first year at the company; eight in 10 of them foot the bills for the application process, too. Mostly, though, the change has to come top-down. Employers have called for action to reform the current immigration system. The most cited ask was quicker processing time, followed closely by the allowance of expedited filing. There also needs to be a solution for excruciatingly long wait times for green cards. For Indians especially, the wait for permanent residency can exceed a decade.